Ringo Starr Vinyl Reissues Due Out In 2018 . Beatles Radio: The Beatles, Solos, Covers, Birthdays, News The Fab 4 and More! If 2017 was a year for a new Ringo Starr album, next year will be an opportunity to revisit the vaults. The Beatles drummer has announced a January 19 release date for new vinyl version of two of his albums, 1973's Ringo and the following year's Goodnight Vienna. Both have been remastered and will be pressed on heavyweight, 180-gram vinyl. 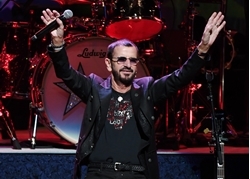 Ringo, Starr's third album -- and only platinum seller -- was a smash featuring the hits "You're Sixteen," "Photograph" and "Oh My My" as well as collaborations with all four his Beatles mates. Goodnight Vienna was certified gold and launched the singles "No No Song" and "Only You (And You Alone)." The albums will be re-issued in their original form, with no additional tracks. Starr released his 19th studio album, "Give Me Love," this year along with his 1999 holiday album I Wanna Be Santa Claus on vinyl for the first time ever. He takes his All-Starr Band back on the road on June 5 for a European tour that begins in Paris.